Recap – January 2015 : Squad – Communicate. Coordinate. Conquer. Hello and welcome to the first monthly update on the Squad Website! Every month we’ll be releasing a monthly recap to highlight the progress we have made on Squad and take the opportunity to show off some of our work. We will continue to contribute regular updates between the monthly recaps, so stay tuned. Enjoy! Added first version of a new main menu. 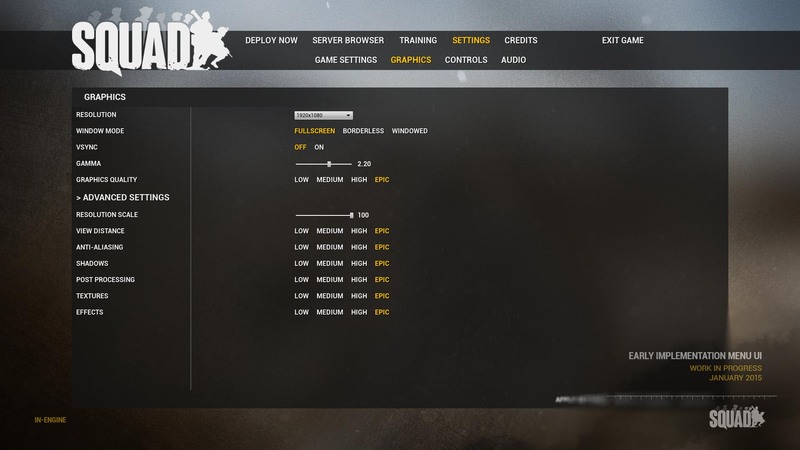 Added initial implementation of some in game menus. 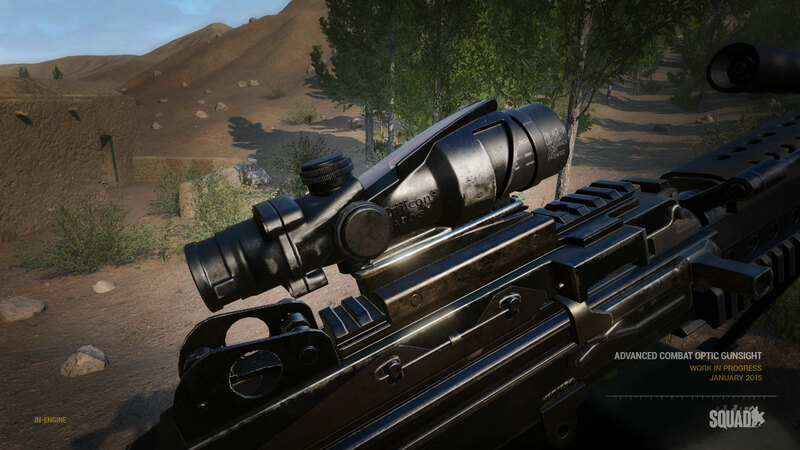 Added support for scopes and other optics. Added ACOG for use on the M4 and M249. Experimented with a prototype of high fidelity render-to-texture optics (Red Orchestra 2 / Insurgency style), for those with high end graphics hardware. Created a number of new movement animations based on motion capture data, including running, sprinting and idle animations. Tweaks to networking behavior to allow very long distance sounds to play. 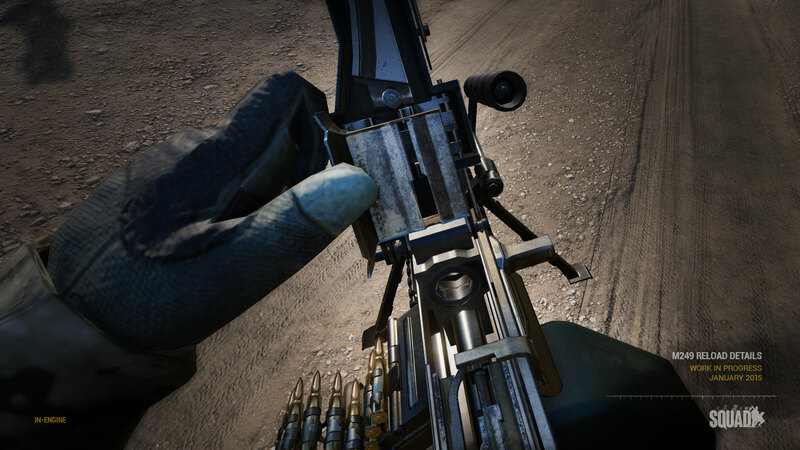 Added new firing sounds for assault rifles and improvements to distance sound attenuation. Added an initial grenade explosion effect. Made improvements to our landscape and master materials. Added textures, rigging and initial animations for the M249. Improvements and fixes to how throwable items are networked. 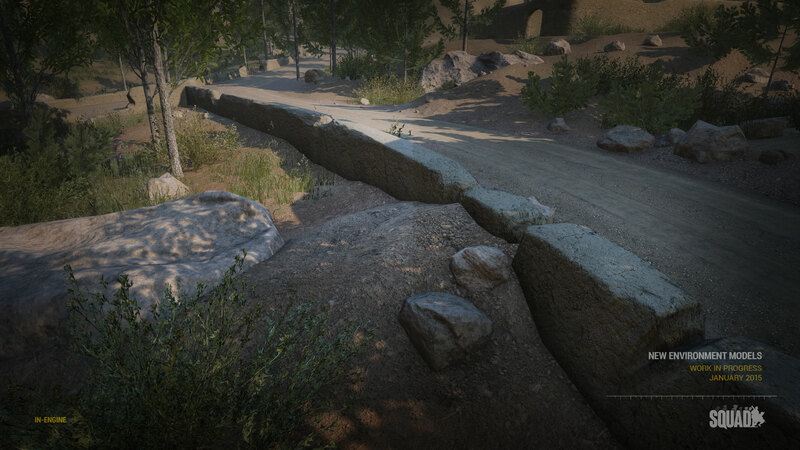 Added basic support for moving water including creeks and streams. Made improvements to the M4 model to support attachables. Initial work on our deployables system. Added a number of environment props. We will be posting additional updates throughout February, so continue to check in to get the most up-to-date information on Squad. Thanks for your support!